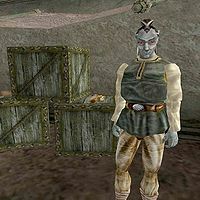 Zebba Benamamat is a Dunmer clothier located outside of the temple in Gnisis. His small stall has a few clothes and jewelry for sale. He is wearing a common shirt and pants and carries a chitin spear. Aside from his natural resistance to fire and the sanctuary provided by his ancestors, he knows no spells. This page was last modified on 4 January 2015, at 19:38.